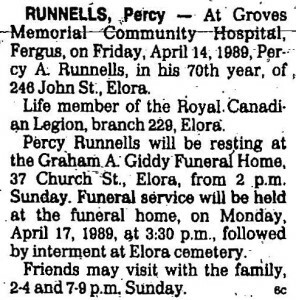 Percy Runnells was born in Elora, Ontario in April 1920. By the time he was attending high school (in the building that is now the Elora Centre for the Arts) he was taking art lessons by correspondence. Runnells served in the Second World War. While stationed in Jamaica he enjoyed painting the local scenery, but during his tour of duty in France he was wounded by shrapnel. At the hospital in Toronto where he convalesced, art was considered therapy, and a room with painting supplies was made available to the veterans. After the war Runnells enrolled at the Ontario College of Art, graduating in 1950. Back in Elora he converted the woodshed in his grandmother’s back yard into a studio and began painting the local people, houses, and churches. His station wagon, which served as a mobile studio, was a familiar sight along the country roads where Runnells often stopped to paint farms and the rolling landscape. Throughout his life, his work was related to his passion for art, whether mounting displays at Beatty Bros. in Fergus, doing design and layout for CKCO-TV in Kitchener, or teaching at the Doon School of Fine Art, the Wellington County Board of Education, and St. Margaret’s School for Girls in Elora. Runnells also designed two of the stained glass windows at Elora’s lovely St. John the Evangelist Anglican Church. 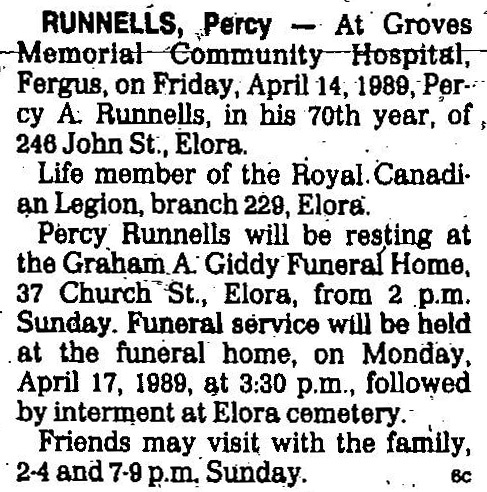 Runnells died in April 1989, a village character and favourite, loved by his many students, painter colleagues, and lifelong neighbours alike.